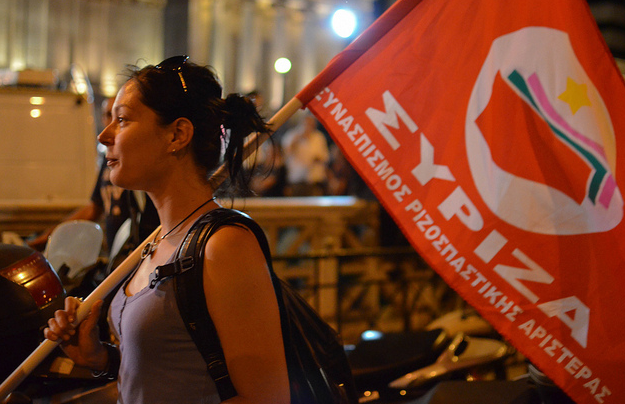 Syriza may not be as radical as we want, but its message is simple: there is an alternative. National elections in Greece are to be held on January 25. Conditions in the country are still awful, with unemployment rates hovering around 25 percent and wages down 30 percent since austerity measures were introduced in 2010. There’s even talk of another three billion dollar cut to pensions. It’s no wonder that the Coalition of the Radical Left (Syriza) looks destined to emerge from the contest as the top party. As the elections draw nearer, the agents of austerity have warned Greek voters of the horrible consequences of a Syriza victory. Greek Prime Minister Antonis Samaras pleaded that if his party (New Democracy) is defeated, there would be a “relapse into the deepest and most dramatic crisis.” German Finance Minister Wolfgang Schaeuble cautioned that there was “no alternative” to austerity policies and that he would not renegotiate existing measures and agreements. In addition to the chorus of threats from technocrats within Greece, Germany, Wall Street, and beyond, there is also an ensemble of voices on the Left that equate a Syriza victory with catastrophe. Rather than brace for the wrath of financial markets these groups on the Left predict that Syriza will fail to overthrow capitalism in Greece. Their claim is that Syriza aspires to be the social-democratic caretaker of the system rather than its gravedigger and that a victory for the party would deepen the capitalist path in Greece rather than derail it. The Greek Communist Party (KKE) has steadfastly refused any collaboration with Syriza, and its members even refuse to march with other groups during demonstrations and strikes, choosing alternative times and routes so as not to be contaminated by different opinions. Unsurprisingly, electoral support has dropped for KKE from 9.5 percent in 2004 to 6.1 percent in 2014. It is at 5 percent today. It takes real talent for a left party to continually lose support as wages plummet and unemployment and discontent soar. The Front of the Greek Anticapitalist Left (Antarsya), currently polling around 1 percent (far less than the 3 percent minimum needed to gain parliamentary representation), is much closer to Syriza than to KKE but they also steadfastly refuse to join forces since, among other differences, Syriza’s platform does not advocate leaving the European Union and the euro. This style of sectarian politics in Greece is certainly not exclusive to it, and many left factions of various stripes throughout Europe and beyond proclaim their opposition to Syriza for similar reasons. Unfortunately, the political conditions today are far more bleak than when Eduard Bernstein and Rosa Luxemburg were debating reform and revolution more than a century ago. Yet very often, the historical failure of social democracy to achieve socialism is provided as evidence of Syriza’s intrinsic opportunism and inevitable inadequacy. Regrettably, the political conjuncture in Greece and beyond does not present us with an urgent task of deciding which path to socialism is the best. All political parties (Syriza, KKE, Antarsya, included) are, quite the opposite, largely debating which path is best for restoring jobs, wages, health care, education, and the like. No one is advocating a radical break with the past and the creation of a new society. The desire on the streets, in the meeting halls, and in the voting booths is not the desire for the new and more excellent, it is a desire for security, predictability, and jobs. There are four “pillars” in the proposal Syriza has put forward (in addition to renegotiating the debt) as its immediate plan of action should it win the elections. The first addresses the basic needs of those hit by austerity and includes free electricity to households under the poverty line, food and rent subsidies, and much more (total estimated cost €1.9 billion for the first year). The second addresses taxation and revenue issues, and includes undoing a slew of recent taxes and restoring the minimum wage to €751 per month (total estimated cost €6.5 billion). The third is a plan to create three hundred thousand new jobs in the private and public sectors (estimated cost €3 billion). The forth pillar includes measures designed to increase popular participation within the state (no cost). The projection is that much of this €12 billion or so of additional spending can be raised through renewed efforts to combat tax evasion and collect of some of the €68 billion in back taxes that are owed to the state, a great bulk of which is owed by patrons of the two political parties that have ruled Greece for the last forty years. In this way, there would not be a need to borrow money or engage in deficit spending. This is certainly an ambitious plan and one that decisively breaks with the policies of austerity, but it is neither an attempt to radically transform Greek society nor an attack on capitalism. In historical terms it is indeed well to the right of the New Deal or postwar European social democracy. Take as one measure of the severe limits of the present moment, and of the conservative trajectory of politics in Greece today, the lack of discussion regarding priests being classified as public servants. Amid the huge push to cut spending and eliminate public-sector jobs, not one political party or even one individual of national political stature has suggested eliminating priests from the ranks of public servants. Close to eleven thousand Greek-Orthodox clerics are currently employed by the state, and thousands more are on public pensions. No party, of the communist left or otherwise, has even hinted that leaving the pay of the priests up to the Church would be a good way of moving forward — much better than firing janitors and teachers. Even the very liberal value of separation of church and state seems unthinkable today, let alone any revolutionary moves to break with liberalism. The political question of the moment is not the mechanics of a transition to socialism but, rather, the meeting of basic human needs, the restoration of some social protections from market forces, and, most importantly, the reassertion of the principle that political communities can and should decide how they will govern themselves. The radical message of Syriza that goes beyond all its particular plans for managing the economy and overcoming austerity is that citizens can and must decide their future and that, against the declarations of everyone from Margaret Thatcher to Schaeuble and Christine Lagarde, there is an alternative. Alexis Tsipras, leader of Syriza, has used the metaphor of the need to “clear the table” in describing the present task, to clear away all the social, ideological, and institutional debris that gets in the way of finally working toward a new, better, society. Left movements of all stripes embrace the democratic principle that politics is not an arena of competition or an attempt to safeguard property but, rather, is the human attempt to try to figure out ever better ways of living and organizing ourselves. The liberal-authoritarian ideology of TINA (There Is No Alternative) has come to dominate the popular imagination so much that any political project that dares posit that citizens can and should decide how their society organizes itself is seen as impossibly idealist and dangerous. In this way, the strategic and tactical failure that underlies the sectarian tendency to oppose Syriza for being reformist is that if Syriza loses — if the ideology of TINA wins out yet again — the Left in Greece (and Europe more generally) is finished for the foreseeable future. No viable left can survive the failure to reassert the possibility of politics. If the Left cannot achieve an electoral plurality after five years of vicious unemployment, authoritarian repression, and national humiliation, then there would seem to be little or no hope for them to ever do so. If under these most extreme of situations the citizens of Greece find it impossible to even imagine asserting their values and judgments over those of legal contracts and speculative markets, then there is no hope for the much more ambitious task of the conscious self-transformation of society that the radical left hopes to eventually achieve. These elections are of the utmost importance, with great regional and global implications and consequences. A victory for Syriza holds the potential to not only reverse the failed and barbaric polices of austerity but also to reassert the primacy of politics. A Syriza defeat, and the ideology of TINA deepens its hold on popular consciousness. Fear and despair will continue to characterize the political ethos of our time. No alternative to capitalism could even be imagined, let alone supported. Of course, a Syriza victory is no guarantee of political renewal. Many dangers will persist, and Syriza may fail in achieving the reforms that it has proposed. As a political party it could become increasingly oligarchical and conservative. The forces of transnational capitalism may prove too much to overcome. An electoral victory combined with the failure to successfully undo austerity and temper the demands of transnational capital would also be the end of a viable left in Europe. It would lose all credibility for a generation or more. Greek voters will decide on January 25 whether they will continue to capitulate to threats and fear or to take the risks necessary to fight back against austerity. The fate of the Greek people, the European left, and global financial markets hang in the balance. Peter Bratsis is the author of Everyday Life and the State. He teaches at the Borough of Manhattan Community College of the City University of New York.